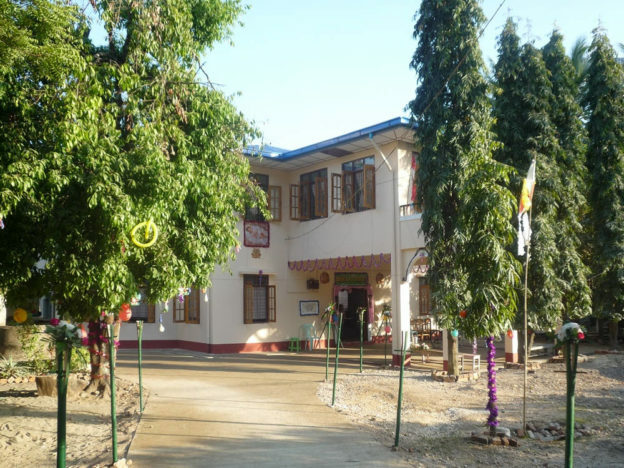 St. Mary Orphanage for Girls is located in the center of Pathein, just 5 minutes away from the Catholic Cathedral and the Mother House of the Francis Xavier Sisters (SFX). 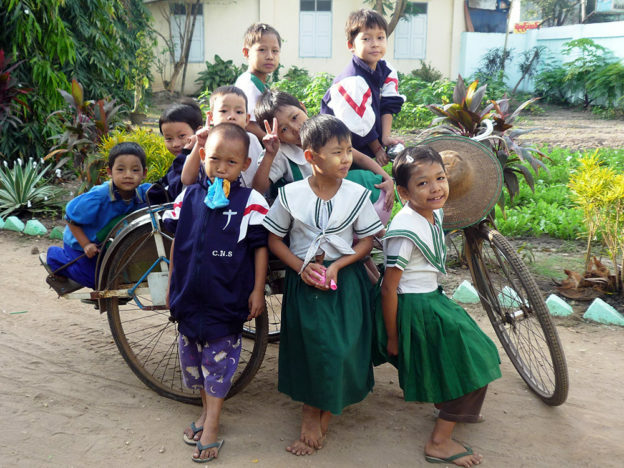 All schools are in close proximity and the Orphanage is also near the General Hospital of Pathein. 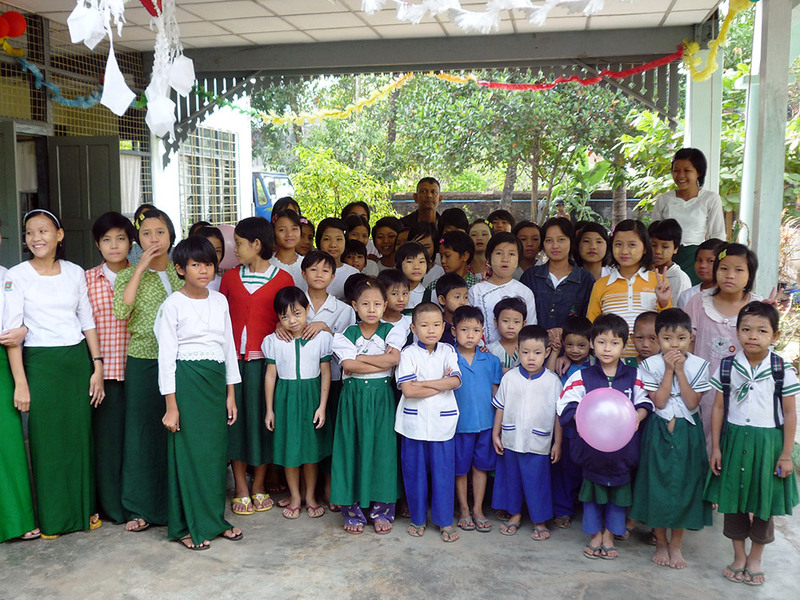 After the Cyclone Nargis in May 2008 the Catholic St. Mary’s Orphanage for Girls had to accommodate 96 girls in an old colonial house where 35 girls used to live prior to the Cyclone. The living conditions of the girls were disastrous and the space situation was appalling. The orphaned girls and girls of single and poor parents between 3 years and 24 years needed urgent help. After many unsuccessful attempts to find a donor for an additional building, the Bishop of Pathein and PIN decided to start the construction of a new building without having the financing in place. In April 2010 the foundation stone was laid. and construction began. The optimism of Bishop John Hsane Gyi proved right and with the help of our friends at Steyler Mission in Germany we received financial support from Maria-Friedrich-Grundler Stiftung, Munich which contributed generously to the construction cost for the new two-storey concrete building. 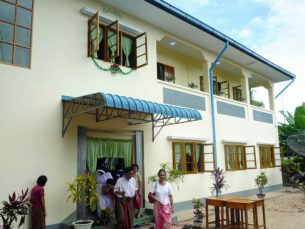 In September 2010 Bishop John blessed and inaugurated the new building and the 40 older girls could move into the new building, leaving more space for the younger girls in the old building. With the additional house the living situation for the 40 older girls had improved significantly. However, the old colonial main building with the 50 younger girls also required attention. The two-storey colonial house, built around 1900, measured about 50 by 80 feet and had deteriorated significantly due to poor maintenance and lack of money. The old house showed structural deficiencies; some of the wooden beams had rotted or had been partially eaten by white ants. The in-house toilets were broken, the wooden floorboards of the upper floor were wobbly and insecure, and the roof was leaking. In short, the house needed urgent refurbishment and renovation. In addition, the overhead water tank for the compound had to be replaced with a new 3,500 gallons water tank. The old water tank, already damaged by Cyclone Nargis, had developed serious leakage after an earthquake in 2012. After the earthquake the 150 persons living in the compound had to rely on rain water and a timeworn well. Both, the water tank and the well, did not provide sufficient fresh water during the long dry season. In 2012 People In Need could introduce an international donor to the Sisters. The donor was willing to take up the lion’s share of the refurbishment cost of the colonial building and to fund a new water tank. People in Need paid for the rest. In December 2013, the new completely refurbished building of the girls’ orphanage was completed. The old house had been taken down and had been rebuilt with the same outline and in the same style as the old colonial house. The new house fits homogeneously into the garden property. About 50 girls and three sisters could move into the bright and spacious new building.